Penicuik house in Midlothian is recognised as the finest example of Palladian architecture in Scotland. Built between 1761-9, the house sits at the centre of an important 18th century designed landscape on the outskirts of Edinburgh, laid out by Sir John Clerk in the first half of the 18th century. In 1857 the house was extended by designer David Bryce, m ore than doubling the floor area of the original building, before being gutted by fire in 1899. 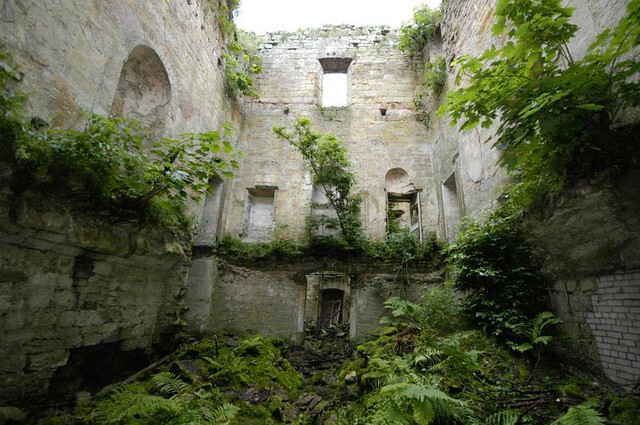 Since then the house has stood as an imposing ruin, structural decay leading to the collapse of the west wall in the 1950's and much of the interior returning to nature. 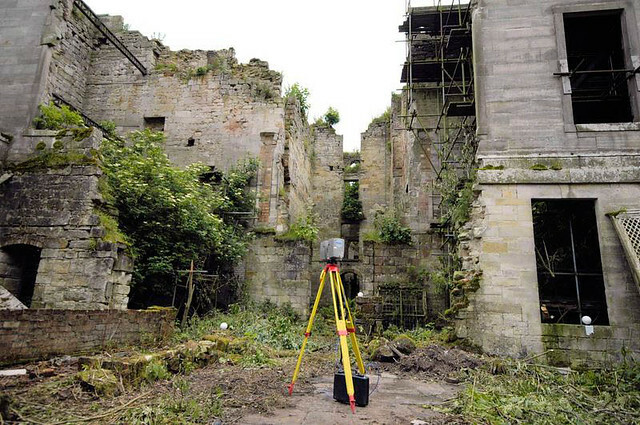 The Penicuik House preservation trust was set up in 1985 to rescue the building and following a partnership with the Scottish Lime centre, a six year programme of work has begun to preserve the house and it's surroundings. 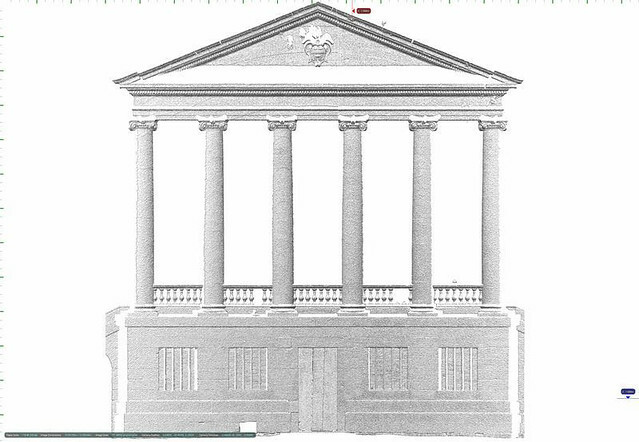 GSS/DJA were approached by the trust to provide a laser scanning survey of the exterior and interior of the building, on the recommendation of Alistair Carty of Archaeoptix. 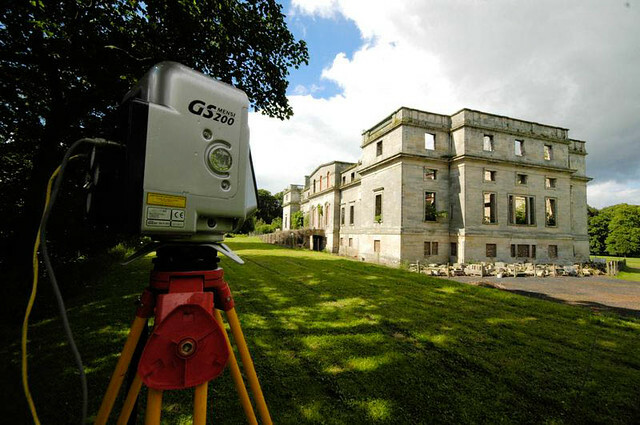 By combining the speed and portability of the FARO LS880 with the range and resolution of our Mensi GS200 time of flight scanner (250m range), GSS/DJA could provide a single solution to gather the data required by the architects Simpson & Brown of Edinburgh to provide accurate and detailed record drawings of the building as it stood. An initial site meeting with the architects and structural engineer indicated a series of practical problems with surveying the site. Before any personnel were allowed within the building, a detailed check of the stability of masonry and walls on this fragile structure was required from a skylift hoist – the importance of the non contact nature of laser scanning became apparent. Also apparent was the level of greenery within the building – obscuring some walls and making some areas unsafe to enter due to undermining of walls. GSS/DJA spent 8 days on site in total, during the wettest July on record in Scotland, capturing 50 scans. Interior scanning using the LS880 and battery pack required the careful movement of the scanner from location to location – wet, moss covered rubble and the clearing of large amounts of foliage made for challenging scanning conditions. Interior survey work was carried out under the watchful eye of the structural engineer, advising on no go areas and ensuring the work was carried out under the strict health and safety requirements of the method statement. On return to our offices, the scan data was processed using FARO Scene, compiling both the long range and shorter range data with total station data to the correct reference origin and registering the X gigabytes of point cloud data. Filtering and cleaning tools ensured that only the required data was left in the point model prior to further processing. GSS/DJA used Pointools and Rhino software to create the deliverable data from the – a series of high resolution ortho rectified images of each wall of the building, inside and out and a series of plan drawings showing scan locations and referencing those to Quicktime VR files created for each location. The final deliverables package consisted of over 30Gb of data, including some 150 ortho rectified images suitable for further tracing in a CAD package.